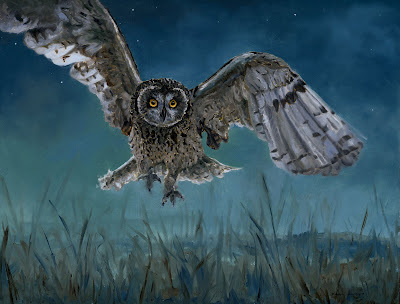 The short-eared owl is a medium sized owl with a length of 13 - 17 inches and a wing span up to 44 inches. While it will hunt in late afternoon or on overcast days, like most owls, it uses the cover of darkness to its best advantage. Feeding primarily on small rodents, it likes to fly low over the ground scouting for prey. I like painting night scenes as they contain an added challenge. For instance, I have shot reference photos of short-eared owls during the day. The trick in creating that feeling of night time is to key the colors to a blue/green palette, then reduce the contrast (so it doesn't look like a 1965 TV western which is supposed to be night, but you see bright sunshine.) I used to think of night as "navy blue" but found that paintings which have some teal tone read well. Guess this is an appropriate day to post the painting. I was up working until 1:38 AM this morning. No, I am not talking about really large SUVs. Rather, about hummingbirds. About 7 days ago, out of the corner of my eye, I saw a hummingbird at one of the windows. I quickly made sugar water (boil 1 cup sugar and 4 cups water), and let it cool. Up went the hummingbird feeder. We have now gone through 5 quarts of nectar .......in 6 days. I have identified 4 species at our now 3 feeding stations. Calliope, Rufous, Black-chinned, and Broad-tailed. In previous years we have had some passing visits, nothing like this. The best time is from 8pm - 8:30pm. I can sit outside in a chair about 5 feet from the lowest feeder. They will go whizzing by me to get their fill as the sun sets. As many as 13 are there at once trying to feed from 8 "flowers". Mini hummer wars ensue and I have had their wings brush my hair and shoulder. What great fun! My painting Forest Whispers has been chosen for the 49th Annual Exhibition of the Society of Animal Artists. Only members of SAA are entitled to submit work for consideration. 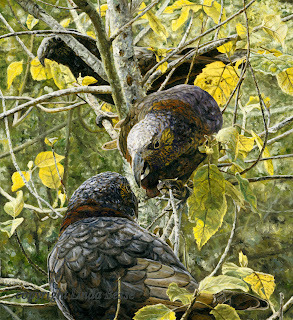 I am thrilled that from this prestigious group, my painting of North Island Kaka from New Zealand was selected. Forest Whispers ............24" X 22"
The North Island Kaka in New Zealand is a brush-tipped tongue parrot. A bird of relatively ancient origin, it appears to have separated from other parrots at an early evolutionary stage and has adapted to a temperate climate. Its closest relatives are the lorikeets from Australia. The Kaka inhabits old forests but will visit orchards and even suburban gardens when it is not breeding season. Their nests are usually up high in old or dead trees and they can lay up to 5 eggs. I had a chance to see Kaka in the wild on the North Island. While their coloring may seem dull at first glance, when they lift their wings, a fiery red/orange array of feathers dazzles the eye. However, it was their interaction with each other which inspired this painting. This grouping of three Kaka lent itself to a range of artistic choices. I arranged the birds to create a serpentine line leading into the painting. It was an unusual choice to place the foreground bird with its back to the viewer, but then, these are unusual birds. The show takes place at wonderful Rolling Hills Wildlife Adventure in Salina, KS. Sept 5th - Nov 1st, 2009. 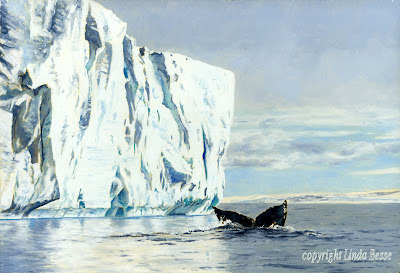 There is something about icebergs which captures the imagination. Maybe because most of us don’t see them everyday. Found in remote polar regions, ‘bergs have an indefinable beauty. An artist’s dream with the array of subtle blues and greens used to paint them. And of course, because of the Titanic, they also hold a mysterious danger. One of the things I wanted to accomplish in this painting is a feeling of distance. It is a bit more of a challenge when one is working on a piece in a small format. The painting also contains a limited palette so slight changes in color can make a large impact. Tonight I will be onstage at the Fox Theatre singing the Beethoven Symphony No. 9 with the Spokane Symphony Orchestra. Our Spokane Symphony Chorale will also be singing the Brahms Schicksalslied (Song of Fate). Both sung in German. I joined the Spokane Symphony Chorale in 1991. What a wonderful experience it has been. It is times like tonight (and the additional concert tomorrow afternoon), when I feel fortunate that I live close to a major city which supports a very talented orchestra and Chorale. Funny, all week when my mind is still, it fills with German and snippets from each piece. I know that will fade in about a week, but I find it fascinating while it lasts. Our conductor grew up in Germany so you might say he is quite particular about our pronounciation. 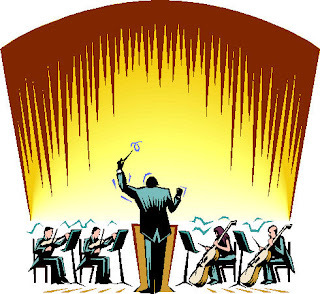 Amazingly, he can conduct the orchestra and at the same time mouth all the German for us. This morning at rehearsal, when all the orchestra was playing full out, he was able to hear a stray note (one stray note) in the bassoon section. Most are familiar with Beethoven's 9th, but if you haven't heard the Brahms piece, it is a true gem. Spring has definately arrived. Every afternoon, I have a couple toms strutting about my yard. Some of them are quite big (for those turkey enthusiasts, our wild turkeys in upper eastern Washington are Merriam's.) They display their fans and parade around in front of the numerous hens ...........which completely ignore them. Even though their gobbling draws me outside away from my painting to watch the spectacle, it is worth every minute. 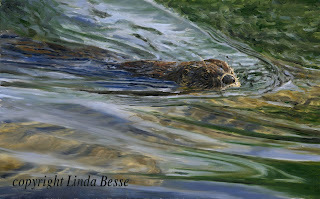 This last weekend at a show in Fallbrook CA (Reflections of Nature), an artist told me that I don't blog enough. (Thanks, Ray.) So, starting now, I will be making a concerted effort to be more interesting so I have something to say more often. Maybe a little more than once a week.